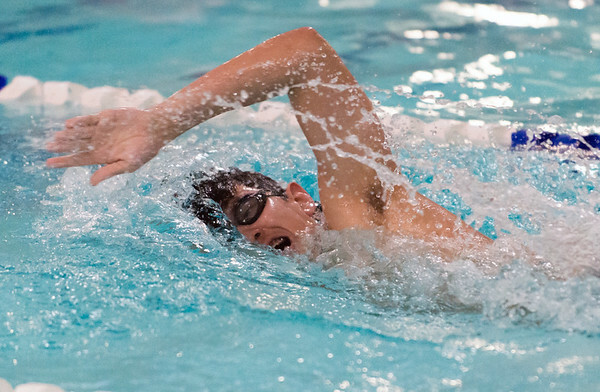 PLAINVILLE - With just a week left in the regular season, Chris Zagorski hopes Friday’s meet will act as a motivator for the Plainville boys swim team. Up against a tough Windsor squad, the Blue Devils fell 95-85 at home. Despite the final score, the Blue Devils did get some strong individual performances on Friday. Joe Michalic won the 200 freestyle and Brandon Paznokas took first in the 100 backstroke. Plainville also took first, second and third place in the 500 freestyle. Nate Lyman won the event, while Matt Lagassey placed second and Kyle Sullivan came in third. Both Lagassey and Sullivan finished with season-best times in the 500 freestyle. Southington still had a number of notable performances on the day however. Derek Melanson and Tyler Heidgerd were both double winners for Southington. Melanson took both the 200 IM (2:11.74) and 500 freestyle (5:13.03), while Heiderd won the 100 freestyle (49.96) and 100 backstroke (57.94). The 400 freestyle relay team of Melanson, Landon Colby, Brian Egan and Heidgerd took first in a time of 3:39.19 with Colby also winning the 100 butterfly in a time of 56.59. In a second place effort, Chase Galayda broke his own school record in diving with a score of 281.45. Hall 40, Southington 33: The Blue Knights dropped its fifth straight game, yet again by single digits. Southington led at the halftime break, but managed just six points in the third quarter while the Warriors pulled ahead. Kelley Marshall led the Blue Knights with 13 points, while Sam Sullivan added seven. Jordan Farrell paced Hall’s offense with 17 points, while getting to the free throw line nine times. Windham Tech 42, Goodwin Tech 40 (OT): The Gladiators dropped a heartbreaker on the road, falling to Windham Tech in overtime after a tight fourth quarter. Goodwin Tech erased a five-point halftime deficit, but was unable to finish in crunch time. Joa Martinez led the Gladiators with 15 points by consistently getting to the free throw line, where she made 11 shots, but the team as a whole missed 14 shots from the charity stripe. Nyssa Foster De Oro added 10 points for Goodwin Tech, while Windham Tech’s Paola Rodriguez dropped 17 points, including nine from downtown. Posted in New Britain Herald, Goodwin Tech, Plainville, Southington on Friday, 8 February 2019 21:43. Updated: Friday, 8 February 2019 21:45.